Well, this review is terribly overdue, but a few months back, the lovely folks at Quo Vadis put out a call for reviewers for their diaries and planners. I signed up, but thought I'd gotten overlooked or forgotten in the crowd of eager volunteers as I saw the reviews start to roll in, while my own free planner was nowhere in sight... Turns out our good friends at Canada Post and possibly Canada Customs (and I suppose, the busy Christmas season) were to blame, as I did eventually receive my Trinote, several weeks after the postmarked date. That's life, I suppose. Anyway, I've had a chance to use the Trinote planner for a few weeks now, and here are my impressions. First of all, the Trinote comes in a few different cover options- I received the black soya, but there's also colourful vinyl and " Club" covers, as well as Chelsea and Nappa leather. The covers are reusable/refillable, so if you were to buy the (presumably more expensive) leather covers, you can just buy the refills or a (possibly cheaper) vinyl covered planner in subsequent years. I'm not sure about the availability of the different cover options in Canada (or at least the Metro Vancouver area). Trinote is offered at Staples, at about $27 CAD, but I think I only saw the vinyl option in black. 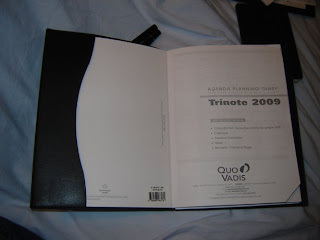 I have seen other Quo Vadis planners at Chapters with some of the more colourful covers, but I can't recall seeing the Trinote there. The soya cover is lightly textured to mimic leather, and is stitched all the way around. There's a nice thickness to it, and it doesn't have the stickiness that vinyl typically has. At 18 x 24 cm (or 7.25 inches by 9.5 inches), the Trinote is a bit big for a purse, but would probably fit comfortably in a briefcase or laptop case as it's not too thick. Although I have been carrying it around in my backpack, I think it's really more of a desktop size for me. When I did carry it around with me, I found it too cumbersome to pull out while on the go. 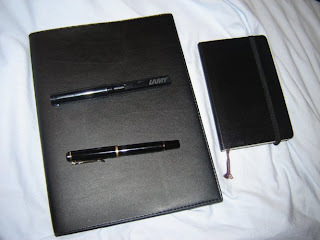 Here you can get a sense of the size relative to a Lamy Safari, a Pelikan M200, and a pocket Moleskine diary. The layout of Trinote really works for me. You get the week across a two page spread, with space for notes and special reminders (who to call, fax, e-mail, things to do, expenses), and daily priorities. Most important for me is the vertical daily layout, broken down into quarter hour segments. A lot of planners only go down to half hour or even only full hour segments, but I work for a consulting firm where we need to bill our time accordingly to our clients and projects, and sometimes I really do just spend 15 minutes on one thing before having to jump to another project. Admittedly, trying to squeeze in some detail like who I did the work for, and what I did into that bit of space isn't the greatest, but it's better than nothing, and it's usually just a few key words to jog my memory when I'm inputting my hours into the system. An example of my work week. I attempted to make use of the priorities as well as the "See-Do" sections. In amongst the miscellaneous bits of information that planners and agendas often have (maps, phone codes, international holidays, min and max avergae monthly temperatures around the world?? then again Moleskines have things like international shoe sizes, so who am I to say...) the Trinote also has a removable phone book tucked into the back pocket of the cover. I don't imagine I'll get much use out of it, but I just wanted to draw your attention to this cute little bit of detail in the notes section: a wee little fountain pen motif. ...which begs the question, just how fountain-pen friendly is this paper? Quo Vadis advertises itself as having "absolutely fabulous paper", and apparently it is by Clairefontaine. I've been a Clairefontaine fan for a few years now, and Trinote boasts the bright white, silky smooth paper that I've come to expect. I think it's a lighter weight paper than in the notebooks I've used in the past, though, as I've experienced some bleed through, as evidenced here. * (I had to turn off the flash to show the bleed through, which is why the paper doesn't look white here). Note that I do have a preference for wetter pens (this was written with a Richard Binder 0.7 oblique cursive italic VP nib), but even with a drier pen I've noticed some bleed through. I've had very little feathering, although one time I tried to write with a gusher of a flex nib and that did feather quite a bit. My overall impressions of the Trinote is that the layout and formatting really jives with the way I think and work. Whether it's helping me be better organized is debatable, but really, it's just a tool to do the job, I have to actually put in the effort myself! The paper is a bit on the thin side, but the bleed through is tolerable for me, especially since I'm using the planner mostly to keep track of my time and what I've been working on. 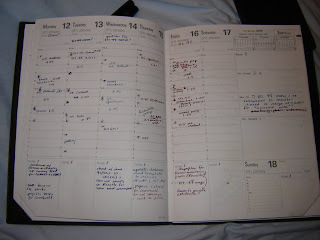 If I were getting this kind of bleed through on a journal or notebook, I think I would be more put off. * I'm not a big fan of the reminder section on the right hand side- I either never use it, or else I have to many things in the "See - Do" section. Happily, I've found that a standard Post-It fits nicely in that area without overlapping the vertical formatting of the daily schedule, and let's face it, Post-Its reign supreme in my world, so I tend to jot things down on the yellow stickies and move them along week to week as necessary. I'm also not a big fan of the corners that you're supposed to tear off to keep your place in the planner. I always seem to forget to tear them off, and I would prefer a ribbon bookmark attached to the cover, especially since the covers are reusable. Heck, I might end up stitching a bit of ribbon on there myself. 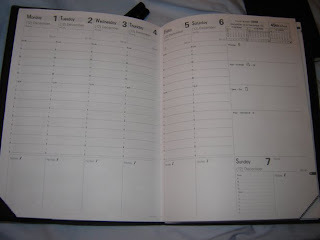 Another thing I find peculiar is that it's a thirteen month planner, running from December to December. The problem I have is that you're going to be duplicating December, whether you continue to use refills of this planner, or like in my case, you're moving from a different planner brand to this one. 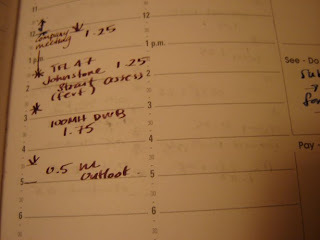 I didn't even touch December 2008 in my Trinote because I was still working away in my old planner (and ok, also because I didn't get the Trinote until January, but still). And next year, if I get another Trinote, I'll be neglecting December in either this book or the new one. It just seems kind of wasteful, doesn't it? Finally, the daily schedule runs from 8am to 9pm, so if your day starts or ends beyond those times, then you're out of luck. Personally, I would prefer that the day went a bit shorter (say until 7 or 8pm) but that there was more vertical room per hour and thus more room to write. So I guess the question is, would I buy this planner for next year? It's debatable. While I like the smoothness of the paper and fact that my hours are broken down into quarters, I'm not sure that it's enough to justify spending close to $30. Then again, I've spent several times that amount this year already on pens that I may never use, so maybe I need to rethink that argument! 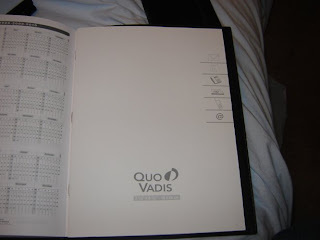 I do think that I'll buy another Quo Vadis planner next year, even if it's not this one. I might go for something smaller that I can carry around with me in my purse or pocket, if I can find one that still allows for 15 minute breakdowns. Would I recommend it to someone else? Yes, if paper quality and organizational tips are important to you. Just make sure that your schedule is reflected in the daily formatting, or else it won't be of much use to you! Thanks again to Karen Doherty and Leah Hoffman at Quo Vadis/Exaclair for giving me this opportunity! 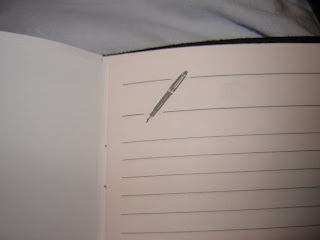 Regarding my issues with bleedthrough and my thoughts that the Trinote has thinner paper than standard Clairefontaine notebooks, Karen Doherty (VP Marketing at Exaclair) wrote to me to set me straight on the facts: apparently the Trinote is in fact made with the same 90 g paper that's used in the notebooks! I'm not sure why I noticed the bleedthrough more on the diary, but it could be that in a notebook (like the one I use to copy down recipes into) I tend to write continuously across the entire page, whereas in the journal I may only jot down a few key words or times in "chunks" down the page, leaving gaps of untouched paper which shows the ink through from the other side. And of course it could be the pen and ink combination. *I went to take a look at my recipe book and sure enough, slight bleedthrough, or at least visibility of what's written on the other side. But obviously it wasn't noticeable enough for me to complain about until now! Funny, isn't it? In any case, I stand corrected and take back my gripes about the paper thinness! Whew, I'm not the only one running behind. I still need to review the Minister they sent me (and which Canada Post kindly bent by stuffing into our tiny apartment mailbox).